There’s nothing quite like a Merbau decking. It’s one of the most beautiful timbers in the world. The natural oils give it a shine that seems to last forever and gives it a depth that is almost unrivalled. Merbau is also one of those rare natural materials that offer both functional and aesthetic advantages. The oils that make it so attractive also make it incredibly hard-wearing and resistant against splitting and cracking. Couple all of that with an Everlast Services expert finish and you’ve got a decking that will look great and provide you with years of enjoyment. A Merbau deck will add a whole new living space to your home and with a natural colour range from yellow to brown it will work with almost any house. Merbau also has a unique grain meaning you can go for a coarse or smooth and wavy texture. We love this material at Everlast Services and we’ve been working with it for over 20 years, meaning we know how to get the absolute best out of this magnificent timber. The other thing that we love about Merbau is that although it’s a hardwood it’s extremely pliable and easy to work with meaning we can create a decking to suit any space you like. 90 x 19: This size is perfect for those who want their decking to have a sleek look, with thinner slats and smaller gaps in between each panel. These slats can also be used for a variety of landscaping purposes, including planter boxes and daybeds. 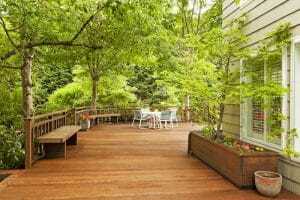 140 x 19: If you love decks with thick panelling, you’ll love this size. It gives decks a wholesome, strong look and you get the added benefit of needing less material to construct your deck, which means it will be built quicker. Why Everlast for Your Merbau Decking? As a 100% Australian owned and operated company we are committed to supporting the local economy by only sourcing Australian products and materials. By using Everlast for your merbau decking, you’re making a decision to support local jobs and help grow the local economy. At Everlast Services we don’t believe that quality should come at the expense of affordability. 20 years in the industry has given us unbeatable knowledge in providing decking solutions. We can use our expertise to provide you with a decking solution that will suit your space, your needs and your vision. We pride ourselves on our ability to communicate with our clients and ensure we leave the perfect product. We can provide a whole range of services that will transform your backyard. Whether you want a garden bed to surround your merbau deck, a pergola to accompany it or a water feature to make it a spectacle Everlast Services can provide it for you.